The ENAT Code of Good Conduct is a commitment label and certification scheme for public and private enterprises and organisations, recognising their efforts to promote accessible travel and tourism. It is the first and only international labelling scheme for the promotion of ethical business standards in Accessible Tourism for All. The Code has 8 guiding principles which, if followed, can help to make travel and tourism accessible for all visitors, in particular, those who experience access difficulties due to disability, long-standing health problems or age-related conditions. Only ENAT members are eligible to sign and display the Code of Good Conduct Label and Certificate. The Code is primarily intended for public or private enterprises that directly serve tourists. It can also be used by organisations involved in tourism policy-making, planning, design and management of tourist venues, production or management of facilities and equipment, tourism marketing, higher education, staff training, travel and tour services, travel bookings, etc. Enterprises and organisations that have signed the Code and supplied the contact details of a resource person responsible for accessibility are authorized by ENAT to use the label and certificate in their marketing and publicity. The certificate and label can be withdrawn if possible violation of the Code is brought to the attention of the ENAT management and upheld, after investigation. 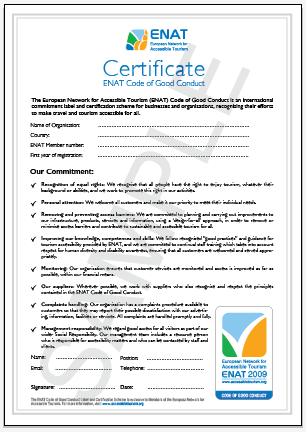 The ENAT Code of Good Conduct is both a European and international accessible tourism label and certification scheme and is available to ENAT members in all countries of the world. Does the ‘ENAT Code of Good Conduct’ label replace other accessibility labels and pictograms used by National or Regional Tourist Boards, cities or private companies? The label denotes the commitment of an enterprise or organisation to follow a set of principles for the development of accessible tourism, within its sphere of activity. The Code does not aim to measure compliance with access standards, national norms or proprietary accessibility schemes and the label is therefore not a guarantee or symbol of “full accessibility”. Signing the Code allows the user to display a European and international label and certificate which can complement existing accessibility labels, providing global recognition for those enterprises and organisations which aim to fulfil the promise of accessible tourism for all. The guiding principles of the ENAT Code of Good Conduct have been chosen to reflect certain priorities, each of which is integral to the understanding and practice of accessible tourism for all. The principles are based on the objectives of the ENAT association, taking into account sound, ethical business standards for customer service. In signing up to these principles, ENAT members show their active commitment to accessible tourism, not only through words but also in the way they work. 1. Recognition of equal rights: We recognise that all people have the right to enjoy tourism, whatever their background or abilities, and we work to promote this right in our activities. - The United Nations Convention on the Rights of People with Disabilities was signed by 139 Member States in 2006. (1) It establishes, inter alia the principle of equal rights to participate in leisure activities (article 30). This should make the inclusion of disabled visitors a primary concern of all tourism and travel providers. By signing the Code, ENAT members recognise and affirm the rights of disabled visitors to be included in tourism and work to provide them with equal opportunities to enjoy this right. 2. Personal attention: We welcome all customers and make it our priority to meet their individual needs. - Wherever possible, the requirements of tourists with particular access needs should be met within the general provisions for information, transport, accommodation and all kinds of services. Where an alternative system or service is established in order to respond to users’ and clients’ functional requirements, this must be of equal quality and shall not entail a greater cost to users or clients. 3. Removing and preventing access barriers: We are committed to planning and carrying out improvements to our infrastructure, products, services and information, using a ‘design-for-all’ approach, in order to remove or minimise access barriers and contribute to sustainable and accessible tourism for all. - The identification of access barriers for a very diverse range of visitors is an obligation of every committed accessible tourism venue and service provider. Barriers can occur, for example, in the design and functionality of tourism information and booking systems on company Websites, in transport systems, in the built environment, in the choice of fixtures and fittings, and in all kinds of services and leisure activities. - In signing the Code of Good Conduct, the ENAT member commits to a process of identifying and removing barriers and preventing new ones from arising. In enterprises or organisations which have been established for some years, it can take several cycles of renewal or renovations before “full accessibility for all” is achieved. 4. Improving our knowledge, competences and skills: We follow recognised ”good practices” and guidance for tourism accessibility provided by ENAT, and we are committed to continual staff training which takes into account respect for human diversity and disability awareness, ensuring that all customers are welcomed and served appropriately. 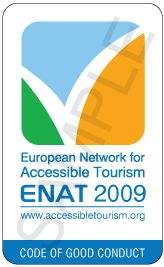 - Commitment to the Code entails a commitment by the ENAT member to keep up-to-date with developments in accessible tourism, to learn from the examples of others and to implement proven good practices, where appropriate. In this the member is supported by ENAT’s resource library of good practices, reports and publications, including analytical tools, accessibility guidelines and references to staff training programmes. - The development of Human Resources, including management and “front-line” personnel, plays a key role in delivering accessible environments and services in the tourism and travel sector. Staff must receive appropriate training to meet and serve a wide variety of customers with confidence. Staff must develop their competences to ensure that visitors who are disabled, frail, elderly or, indeed, very young are all served correctly. Particular procedures and skills may need to be learned, such as assisting disabled persons during emergency egress from buildings or the use of special equipment. - ENAT members also provide technical consulting services to other members of the network and participate in national and international research and development activities in order to advance their knowledge and competences in accessible tourism. 5. Monitoring: Our organisation ensures that customer services are monitored and access is improved as far as possible, within our financial means. - Where enterprises and organisations welcome visitors as part of their regular activities, the ENAT Code requires that customer services must be monitored to ensure that high standards are consistently maintained. The accessibility of services and facilities, as well as all relations with customers (enquiries, booking, reception, visitor services, etc.) should be continually assessed – also through the use of customer feedback. Financial resources should be assigned to monitoring and improving access. When access improvements are made, publishing information about the changes will be appreciated by new and returning customers. 6. Our suppliers: Wherever possible, we work with suppliers who also recognise and respect the principles contained in the ENAT Code of Good Conduct. - As a signatory to the ENAT Code, an enterprise or organisation marks itself out from others as a “front-runner” in the race to serve all tourists, whatever their access needs might be. However, many of the suppliers and business partners in tourism that ENAT members need to work with may not be as concerned about accessibility. It is well known that the “chain of accessibility” is only as strong as its weakest link. Therefore, to avoid problems and to give the best service possible to visitors, ENAT members must seek, wherever possible, to engage with suppliers and partners who appreciate and can fulfil the ENAT accessible tourism principles. 7. Complaints handling: Our organisation has a complaints procedure available to customers so that they may report their possible dissatisfaction with our advertising, information, facilities or services. All complaints are handled promptly and fully. - Consumers who receive the services of ENAT members, whether for direct payment or not, are entitled to expect the declared or advertised levels of service, as in any contractual relationship. The provider’s commitment to handle customers’ complaints efficiently and thoroughly is of particular importance to visitors who may encounter access difficulties. 8. Management responsibility: We regard good access for all visitors as part of our wider Social Responsibility. Our management team includes a resource person who is responsible for accessibility matters and who can be contacted by staff and clients. - A named resource person, at management level, must be identified as a contact person for accessibility issues. This person should be available to handle questions and issues raised by colleagues and staff as well as dealing with customer enquiries and feedback. The role of access manager can include: defining policies and priorities for accessibility, advising management on procurement, planning and implementing accessibility measures, staff training, monitoring of targets and performance, coordinating special services for customers, handling unforeseen problems and seeing that customer enquiries and complaints are handled correctly and promptly. The ENAT Secretariat can provide members with expert advice and assistance in all aspects of accessibility management. 1). United Nations Convention on the Rights of Persons with Disabilities and its Optional Protocol (2006). (e) To ensure that persons with disabilities have access to services from those involved in the organization of recreational, tourism, leisure and sporting activities."